"I Don't Know" The Oil Drum: Campfire Crisis Blogging: Opiate of the Masses or Catalyst for Change? This Campfire post is meant to provide some insights into the robust local sustainability movement here in the Seattle area. We thank Nate and other leaders at The Oil Drum for this opportunity. 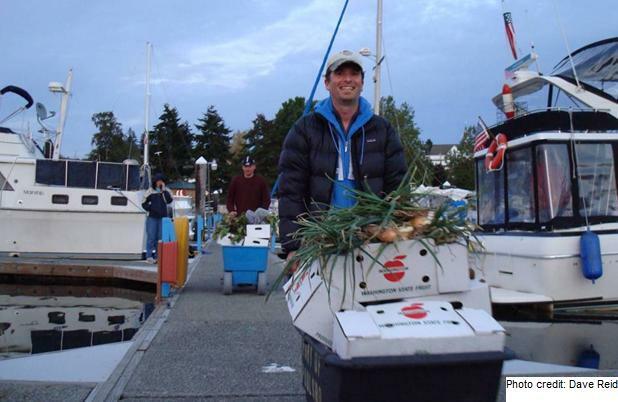 Sustainable Ballard is the original incubator/the mothership for the rapidly growing Sustainable Communities ALL Over Puget Sound (SCALLOPS) network, now an amazing 72-town strong movement! Vic Opperman has been a tireless leader and catalyst for the sustainability movement in Washington State. Along with David Wright and Artemis, Vic founded Sustainable Ballard 6 years ago as a channel for her despair over the Iraq War. When protesting the war failed, she decided it was wiser and more productive to start building a resilient community very close to home. From the get-go, Sustainable Ballard has enjoyed excellent relationships with local officials, from spearheading the first sustainability sub-committee at the local Ballard Chamber of Commerce, to providing feedback to Governor Chris Gregoire when she spoke at the May 2008 NW Biodiesel Network, to direct input into the Seattle Mayor's office. We are co-presenting a food security seminar with City Council President, Richard Conlin, at the Seattle Green Festival this Saturday, 2 PM. At this weekend's Green Festival, SCALLOPS has the southwest corner of the Exhibition Hall reserved as a Community Action Center, to encourage free-wheeling exchange of ideas for the people of Puget Sound. Rep. Mary Lou Dickerson works with Sustainable Ballard on homeless issues. Vic Opperman, one of the original co-founders of Sustainable Ballard, was recently honored with a Green Trailblazer Award from the Greater Seattle's Business Association at its Business & Humanitarian Awards Dinner. The president of Sustainable Ballard and organizer of the Seattle Green Festival is Jenny Heins. The leader of the booming Garden Guild is Ingela Wanerstrand; the Urban Crop Circle leader is Rhonda Brown. Local Food, now seemingly everywhere, still needs guidance from Food+Health Guild leader Jennifer Mundee. Former Home and Environment Guild leader Andrea Faste is a valuable liasion to Groundswell Northwest, our local parks preserver, while Julia Fields heads up the engagingly creative Undriving program to encourage people to try out a carless lifestyle. Cathy Tuttle heads up not only Sustainable Wallingford but also Spokespeople, a local community group seeking to encourage newbies to take up bicycle riding. Many of the leaders in the SCALLOPS towns are female, and Sustainable Ballard is in correspondence with both Sharon Astyk (upstate New York) and the lovely Crunchy Chicken (another Ballard-based resource), http://www.thecrunchychicken.com/. Finally, your Oil Drum blogger, under the nom de Web of Sustainable Ballard, is a relocated Jersey Girl who still keeps a watchful eye on happenings back East. SCALLOPS and Sustainable Ballard both totally rock. I have to say, I'm quite excited about a lot of what they are doing locally and they are inspiring people across the country with some of the things being spearheaded here, giving hope to those who live in areas that are, shall we say, not as forward thinking. I am a proud Ballardite and feel very lucky to live here and have the opportunity to participate. If you want to read a brief report of what was covered at this week's Sustainable Ballard meeting, you can read my synapsis here. I look forward to working more with the local groups and getting more involved in both the SCALLOPS aspect as well as the Seattle Peak Oil group. You might want to change "my synapsis here" to "my synopsis here." That's what I get for trying to type and watch two kids at the same time. Very nice exposure for land dwelling scallops in NW Washington State. I am also an area resident and a relocated New Jerseyite (1967). Just thinking out loud now. Perhaps you and our list readers can help. We have an opportunity to make concrete recommendations to local governments. Most interesting to me are events relevant to this economic bubble and the impending 'perfect storm' preventing recovery from this recession/depression via downslope of global oil production. Can we accept the fact that recovery will not be current status quo for American's 'way of life' ? This said then we need to address the downward adjustment to what is to be our future sustainable economy. There will be a painful transition in the process of devolving from our current consumption levels. Associated with this will be, in my opinion, systemic underemployment and deflation followed perhaps by inflation as occurred in Argentina. Now here is my trial balloon . Should government be proactive in growing localization and making jobs for people in the transition - what do you think? Our local production systems of manufacturing and food production are held in check by cheap imports, industrial agriculture and cheap transportation. This will not go away under economic duress, witness the crowds at Wal-Mart and Costco. And everyone struggling to survive will be shopping the specials. We should also assume declining ability of national government to support local iniatitives. We need to take care of ourselves. 2.Use county/city land to make farms, orchards, dairies to grow food to supply schools, government and welfare recipients. Make jobs and basic training in agrarian skills a priority. This puts them (government) in business. this local produce will displace imported goods at subsidizedcompetitive prices. How soon are you talking with your local government officials? Do you have a sense of where their knowledge base is about peak oil and climate change? I think that's key to a successful presentation. The way we talk about this within SB is "finding one's place on the spectrum of sustainability. Some people are just taking baby steps, other folks are much further along. I think that Gail has already shared several of her presentations here with the Oil Drum readership. Re: "We have an opportunity to make concrete recommendations to local governments." I do disagree with your assessment of the current shopping trends that you are seeing (re: Our local production systems of manufacturing and food production are held in check by cheap imports, industrial agriculture and cheap transportation. This will not go away under economic duress, witness the crowds at Wal-Mart and Costco.). I think as the crisis deepens, you will see anything based on a large scale framework, start to fail. 1.Increase our use of people in government services, ie make jobs, instead of using machines. This may work in the short-term, but I'd rather see people get away from service jobs and into more hands-on skills. Yes, we are doing this here in Seattle: Richard Conlin noted that the city is actively reassessing vacant land. The rep from the City's pea patch program ended her talk to Sustainable Ballard on Monday night with a little grin and said "I have two closing words: guerilla gardening ;-)"
3. Use city/county land/facilities to launch business ventures. Some ideas are recycling for reuse electronics and computers. Remanufacturing from frame cars and trucks replacing engines, etc with updated technology. That's an intriguing possibility; I haven't heard of that approach before. We are lucky here in Seattle to have the fantastic Re-Store which focuses on salvage and reclamation. The other great local resource are the Boeing engineers and machinists. As the airline industry fails, I could easily see these men and women shifting their skills over to remanufacturing and cottage industry repair of electronics, etc. Also, the e-trike manufacturer (Frankentrikes)for the Sail Transport Company repurposes her bicycle back ends for integration/welding into the frame. People like this just never cease to amaze me. A foreigner? What language does he speak because here in Ballard we like our petroleom products, they are what drive our industrial economy. Not all of us want to live by selling $15 organic ear wax candles at the upscale farmers market. Next these enviro-yuppies will make us change our beloved Bardahl oil sign into a giant compact flouro sign for hemp products. Uh, yeah. As much as I tout the enlightenment of people who live in Seattle, there are still, unfortunately, the majority who are relatively clueless and cling desperately to their current way of life. There, apparently, is nothing between classic hippy stereotypes and the status quo - certainly not solutions to the problems at hand. Wait a minute, Crunchy, you offer a solution! As in Ghostbusters, who ya gonna call when there is chaos? You have to be in the mayor's office when the call comes in, but if you are, the majority will go along like sheep. 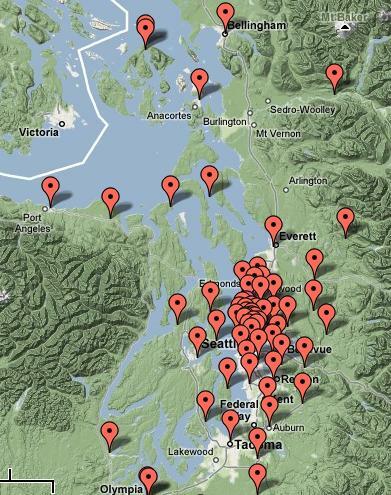 When things get tough and the U.S. is no longer able to maintain order, Puget Sound will find it must sustain itself. Residents must perceive this on a subconscious level. This is a tremendous advantage PS has over most other regions, along with a reasonable growing environment and a local activist core. Alaska has the same internal focus, but we have crock for weather. My sister has been looking for a sustainable haven in the PNW. Suddenly her plans don’t seem so wet. Baaah. There aren't too many places that are set up as well as Seattle (in the West) for dealing with the coming energy and climate change issues. We have a strong agricultural base, but not enough production to provide for the population we have now. Alaska would be fine without Anchorage, Fairbanks, Mat-Su, Juneau and Ketchikan. But they aren't going anywhere. The yield on wild game this far north is pathetic. There is one brown bear per SQUARE MILE in the best bear habitat anywhere which degrades to one bear per thousand square miles away from salmon. We do have a lot of land, but there is a reason nobody lives out there. The value of a moose drops rapidly away from the road and water ways. Few people retain the old ways. Non-fossil fuel dependent transportation is for show not work, just like your sailbosts, but if you can put your boats to work maybe we can use our dogs. The hope is fish. Fish we have. While I think the Puget Sound does have some inherent built-in advantages, I would not be so quick to dismiss the rest of the United States--or the rest of the world, for that matter. Re:"When things get tough and the U.S. is no longer able to maintain order, Puget Sound will find it must sustain itself." I don't believe in a Mad Max scenario, btw, and part of what we are doing via the Sail Transport Network is setting up regional trading centers that are reachable by water and remaining rail. We just had an intense discussion tonight about its scalability; how can we deploy this model at a national level. Anyway, I did have a question about the Sail Transport Network... on the website it states that you can get your produce "delivered farm-to-market without burning a single drop of hydrocarbon fuel". What about the fuel used to transport the produce from the farms to the boats? When this program scales up will it be reasonable to assume that you'll still be using cargo bikes to deliver the produce from the docks to downtown Ballard? My comment was aimed at Cold Camel, not you. The last trip used an electric-based truck up at the farm, and the "final mile" once we arrive at the docks is most ably handled by Segue and her e-trikes (battery-operated). We have just partnered with Spokespeople to explore help from their bicyclists and their bike trailers. The idea here is that we would reserve the e-trike's battery power for the hilly areas, and ask the cyclists to take on the deliveries to flat downtown Ballard. The sailors take the mission pretty seriously, and sail engineless (no oil). In fact, that's one of the current minor issues: finding enough crew with that old-fashioned skillset. We will be recruiting at the Green Festival this weekend and hope to find some more. So if you know of anyone, please send them our way. Hmmm, my brother used to teach sailing through the UW and is a member at Shilshole, but he's in Paris for a month. I'll let him know about your project - he might be interested? I have a few others in mind (that live up here in North Beach) that I can ping to see if they are interested. That's pretty cool about the bike power - I guess the question still remains... do you guys see this scaling up once you get all those farms around Puget Sound involved? Maybe you should name your table at the Green Festival "An Inconvenient Booth". Damn, I better go to bed. I'm getting punchy. I live in Seattle (on Phinney Ridge, to be specific) and find myself surrounded by almost total ignorance about this stuff. Even among academics and other smart people. Yeah, it can be a depressing topic to talk about; I think the regular TOD posters/readers know that. Nate's also posted interesting essays about the psychology of previous investment: if you're a member of the (no-longer) solid middle class, you want to believe your lifestyle can go on forever. I mean, it's The American Dream, right? But heyyyyy, if you're looking for kindred souls, please check out the new Greenlake sustainability group or the Ravenna one nearby. If you're a member of an elitist death cult, you want to go on believing that you're far more enlightened than the masses. Hmm, elitist death cult. I find your ideas intriguing and would like to subscribe to your newsletter. Might I also suggest the Seattle Peak Oil Awareness group that meets at the Phinney Neighborhood Center every month? There are many positives to the Seattle lifestyle such as good transit, walkable neighborhoods, and few children; but the eco-smugness of some of the newcomers drives me nuts. Too many people here view sustainability as a fashion identity to wear on their sleeve. Driving one’s Prius to buy organics at Whole Foods does not make one’s lifestyle environmentally friendly. It is surely better than taking the Hummer out for a spin to KFC, but it is still unsustainable. Perhaps I am getting old before my time, but I miss the more humble version of the city that I remember. Yes, there's a LOT of eco-smugness. The fashionability of being green, buying green and still having all your stuff and not having to change your lifestyle has tremendous appeal. It's a trend that, unfortunately, goes beyond Seattle. The part of Seattle I live in is still drinking whiskey from a flask at age 17 while killing time at the Ballard Denny’s. Queensryche was the king of the local music scene and Microsoft had yet to litter the landscape with millionaires. I choose to make my home in downtown Everett these days. The place has a slight inferiority complex that repels hipsters. In my opinion, this is a good thing. I am active in my neighborhood association and am on a first name basis with the mayor and most of the city council. Somehow, this was never possible when I lived in Seattle itself. I have heard Everett’s mayor, Ray Stephanson, talk about peak oil publicly and in an informed manner. Seattle’s mayor, Greg Nickels, is aware of peak oil but just cannot seem to accept what that means for the future. Local political leadership is important to setting the tone and, I believe, that an overly smug political class will lead to a harder fall when it comes time for reducing public services. It is shocking but true that the owner/sailor of the sail-based CSA is from another coast far, far away: as in, northeastern Scotland. I dunno though, last time I checked, they speak English there with quite the charming cadence. In addition, he's co-organized Seattle Peak Oil Awareness, a community partner of Sustainable Ballard. Seattle Peak Oil Awareness is a local citizen group seeking to develop more resiliency against the problems we face due to the lack of available cheap energy. SPOA has a vision of creating a "small town within the city" to address the needs of its members in post-peak oil society. Members are actively working to turn that vision into a reality. Me thinks that's pretty impressive for one of them "furriners". A little further west of Olympia is Grays Harbor county where the local PUD (public utility district) is "owned" by the people: today we get our electricity from various sources, but primarily a big power company, but wind power and water-based ocean tide power are being planned for. Being the poorest county in Washington State, Grays Harbor has benefited from that status by having a majority of human scale dwellings and a minimum of McMansions (which I assume exist, though I haven't actually seen one), a great public transit system, and many local farms. I have thought about relocating to Aberdeen, WA. It is a pedestrian scaled town with a decent port, rail lines, and nearby natural resources. I think it and Hoquiam will fare comparatively well as the economy declines. Generally, abundant resources, a low population, and a good physical layout all speak in favor of Grays Harbor. The biggest problem that I see is lack of a social life. I stop in town to eat 2 or 3 times a year on my way to or from surfing at Westport and I’ve gone to a few parties in the area with a friend who used to write for the Daily World. As is often the case in rural areas, many people seem proud of their ignorance. The high level of existing poverty and low levels of education are major drawbacks. I have seen a few McMansions on the hill north of town, but they mostly appear custom built rather than occupying subdivisions of conformity. Puget Sound ought to install a progressive food tax. Install it gradually, but start it now to get local government, farmers, and residents hooked on the income. Put a tax of a penny a mile per $1.00 value of food for each mile between farm zip code, store zip code, and residence zip code. Rebate 2/3 of revenue equitably to registered residents. No tax for food produced and consumed in neighboring zip codes. If the average person spends $5000 a year on food which comes from an average of 100 miles away, he/she will pay $5000 in taxes but receive $3300 in rebate, leaving $1700 for the local government. A town of 30K would have $50M in additional funding, so other taxes could be dramatically reduced. A poor person who spends $3300 on food which comes from his neighboring farms would pay nothing in taxes but receive a rebate that entirely paid for his/her food. Farmers would require no subsidy. Since there is no tax, sales between farmers and local residents would not need to be regulated. The key component is that government, residents, and farmers all benefit in a tangible way. If you don’t leave money for the politicians and poor people, it will never gain political traction. Equally key is an isolated region where few calories are purchased elsewhere and imported without tax. Hmm lets see Tomatoes at Farmers market at $4.00 per pound versus 69 cents at supermarket. The well off buy the expensive tomato and those just surviving go to the farmers market for a quick lunch on the way home from shopping for best prices. If the Tomatoes sell for $8.00 a pound, all the better. Suddenly gardening becomes financially attractive, and farming for food becomes realistic. The rich will subsidize the poor, or let out their yards for 1/2 the produce. But the tax transition is challenging. You're right, we do need a better idea. But just like Moose Nugget Stew, the one who complains becomes the next cook. You're up, Richrd. For me - I am thinking we need to do case studies of communities in parts of the world that are not influenced by these industrial, publically subsidized competitors. My own observations are limited in this context but I have profound conclusions. For us, the quintessential consumers we are tending to call 'sustainable' a comfortable path that allow us to maintain current status quo. Whereas my study subjects were living at a simple level, totally localized yet 'modern. We need to look carefully at role of local government to assist in public welfare during times of economic distress. I propose public/private partnerships to ensure full employment and reeducation of the people. At first, excuse me for my provocations! I was looking for a while at the picture at the start of the article. I was starting to think what is really sustainable at this photo. In my mind, I was starting to remove everything that was made of oil or that uses a lot of energy to be producted. That is, what I finally see in my mind: I see some naked people swimming in a see. I think, there is really a long way to go to balance everything out without having to go back to the Dark Mid Ages. I also live in Seattle and all I see are forests of SUV's. Ballard is jam-packed with them. Maybe in our sustainable future (10,000 ad?) they could be recycled. Mound them up, cover them with soil and use the resulting mountain for terrace farming... organic of course. Maybe in our sustainable future (10,000 ad?) they could be recycled. 10,000 ad? At that point machine gods will be tearing apart the entire solar system for raw material, and I highly doubt they'd avoid a nice juicy ball of iron like the earth. Wow, what an informative, spirited piece on sustainability initiatives in the Seattle area! This commenter had the opportunity today (at Seattle's Green Fest) to personally speak with both TOD reader Sustainable Ballard and Sustainable Ballard founder Vic Opperman--both approachable, knowledgeable, unassuming and committed leaders in the local sustainability scene. That burgeoning map of SCALLOPS communities shown above speaks volumes to all that they've been able to achieve here in the Puget Sound area through Sustainable Ballard and the SCALLOPS network. Let's hope that both groups continue to grow robustly!